Bengaluru FC B got back to winning ways with a dominant 2-0 win over Ahmedabad-based ARA FC in a Round-6 encounter of the Hero 2nd Division League at the Bengaluru Football Stadium, on Wednesday. Second half goals from Naorem Roshan Singh (47’) and Altamash Sayed (73’) sealed the points for Naushad Moosa’s Blue Colts, as they moved seven points clear at the top of Group A in the standings, while extending their unbeaten run to six games. ARA ’keeper Abhishek Das pulled off a point blank save from a Myron Mendes header after Altamash Sayed’s cross as both teams went into the tunnel with the scores unchanged. The second half sprung to life inside two minutes as the hosts broke the deadlock. Roshan Singh capitalised on a miscued clearance from Abhishek and slotted home from close for his fourth goal of the campaign. 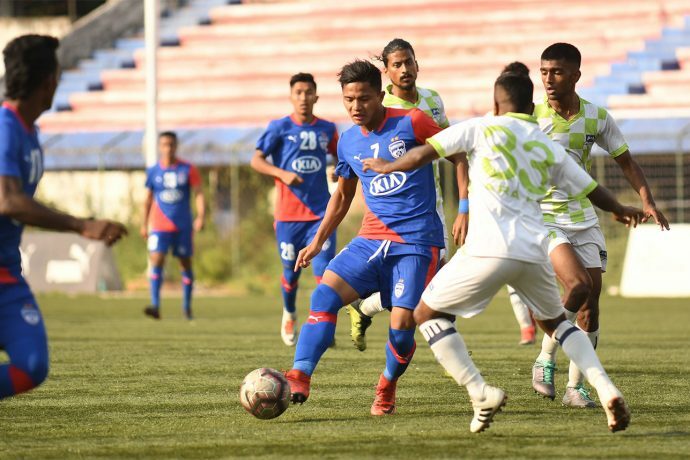 Bengaluru FC B now travel north to face LoneStar Kashmir on Wednesday, March 27, in a fixture that has been rescheduled to take place at the Vaishno Devi Shrine Board Sports Complex, in Katra, Jammu.